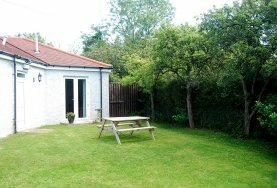 A superbly equipped and apportioned self-contained single storey annexe with dedicated main door and private parking in courtyard. Ideally located in the City of Edinburgh for easy access to local transport and amenities yet beautifully set amidst secluded surroundings. The long entrance hall has a large cupboard for coats and shoes. 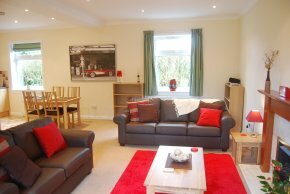 The L-shaped living area includes a bright and spacious sitting room with 3 seater and 2 seater settees, an ornamental fireplace, HDTV with HD Freeview, HD DVD player and iPhone/iTouch docking station and integral amplifier. Double patio doors from sitting room lead into a large west facing secluded garden which is shared with the main house owners. The dining area seats up to four people. 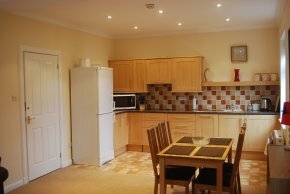 The kitchen area is fully equipped with fridge freezer, microwave oven/grill/conventional oven, ceramic hob, dishwasher, washing machine, toaster and kettle. The spacious master bedroom has a super king sized bed. If required, and by prior arrangement, this bed can be split into two single beds. The room also comprises a large built in wardrobe and storage area. 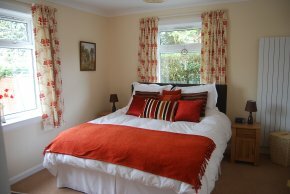 In addition, a single bed can be set up in the sitting room area if required (an additional charge would apply). Situated off a private cul de sac, the Annexe is in a central but quiet location near to shops and local services, just 200m from the local bus route. The Annexe provides the perfect base for you to visit the numerous attractions and international events throughout the year. These include the International Edinburgh Festival, International Film Festival and International Book Festival. In addition, there is Edinburgh Castle, Edinburgh Zoo, the Scottish Parliament, the Royal Yacht Britannia, the Forth Road and Rail bridges, the extinct volcano in the heart of the city "Arthur's Seat" and Holyrood Palace to name but a few. 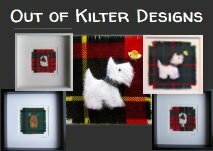 These pictures, hand made in Scotland, bring together everything that the designer and owner of 'Out of Kilter' loves - ...three iconic Scottish animals, the Highland Cow, Black-faced Sheep and Scottie Dog, all mounted on genuine kilt fabric, which has been recycled from the trimmings of the kiltmaking process from Scottish kiltmakers. The property's weekend rates apply to: Friday and Saturday nights. Prices may be subject to change at the advertiser's discretion. Payment can be made by: Mastercard, Visa, Visa Delta, Visa electron, JCB, Maestro, cheque from UK Bank or Eurocheque (UK GBP). Rates includes all utility costs for duration of your stay including heat, light, linen and towels. 25% of total rental required to reserve the apartment and balance due in full 6 weeks before arrival. A refundable Security Deposit of 150 GBP will be charged 6 weeks before arrival for all rental periods where the total number of nights booked ranges from two nights to two weeks (14 nights) inclusive. For rental periods between 15 days and one month (up to 31 days) the refundable Security Deposit will be 300 GBP. For rental periods exceeding one month (31 days) the Security Deposit will be agreed at the time of booking. Cancellations: You are strongly advised to effect holiday cancellation insurance to provide you with the relevant cover should this be required. If the accommodation becomes unavailable for any reason, we will make every effort to provide you with alternative accommodation. Should alternative accommodation not be found, a full refund will be made. Note that we cannot however be held responsible beyond a full refund and we will not incur any further liability for damages or consequential loss. At The Annexe, we respect your privacy, and aim to comply with the latest data protection regulations. This policy explains how we collect and handle data relating to website visitors. Please note that this policy may be altered in the future. It was last updated on 1st June 2018.. The information is being collected by the Annexe and the person responsible for handling data is Fiona Young who can be contacted via email at info@theannexe.info. Your name and contact details when you make an online booking. When you contact us, make a booking or check-in, your data is only used for the corresponding purposes. We will not pass your contact details and other personal data to a third party. When you check-in to The Annexe you will be asked to complete a document confirming your name, address and contact details. This document will be scanned, encrypted and securely stored for a period not exceeding 12 months subject to the other conditions detailed within this Privacy Statement. The paper based check-in document will be securely destroyed within 48 hours of receipt. The accuracy of your information is important. If you change your email address, or if you believe any of the other information we hold is inaccurate or out of date, please email us at info@theannexe.info. We will promptly correct any information found to be incorrect. When details such as your name and email address are submitted via email, this can never be guaranteed to be 100% secure. As a result, while we strive to protect your personal information, we cannot guarantee the security of any information you transmit to us, and you do so at your own risk. Once we receive your information, we make our best effort to ensure its security on our systems. Calendar ABCPro This enables the calendar system to display the correct month. It stores no information about the visitor.